Guest contributor Berna Erol is the founder of iKid Apps , which reviews the best iPhone, iPad, and Android kids apps, and offers a wealth of tips for parents. Follow her at @bernae on Twitter. Smartphones and tablets, combined with great apps and sensible screen time, can do wonders for entertaining and educating our children. Nevertheless, the interaction with these devices is still limited to a few gestures, so they do little help with developing the kids’ motor skills. This is why we are very happy to see several companies, such as Disney, Griffin Technologies and Lego Group, are creating physical tools and toys that can be used interactively with iOS devices. With the help of these toys, kids benefit from the adaptability and entertainment value of the digital medium, and motor skill development and high level of interactivity provided by the physical medium all at the same time. Below are the five best toys we identified for you that work perfectly with your iPhone, iPad, and even your iPod Touch. Make sure to also check out Best iPad apps for kids and Best iPhone apps for kids. Lego has taken on a whole new form with the Life of George game. 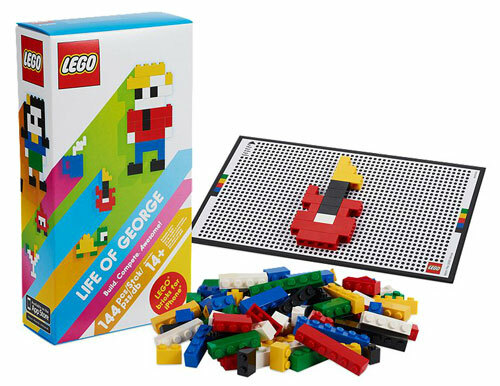 This innovative product assigns players with certain objects to build as they follow the life story of “George.” As players build Lego models on the interactive build mat, the iPhone app works to determine how quickly and accurately models are constructed. Kids (and adults) can also build their own scale models on the mat. A great find for the budding architect. Disney AppMATes are specialized Matchbox-sized cars that come in kids’ favorite Cars characters, like Lightning McQueen and Tow Mater. 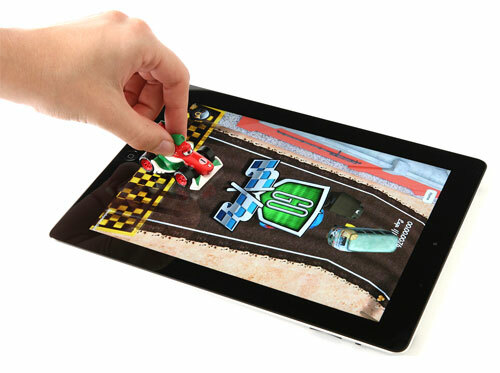 When placed on top of the iPad AppMATes app, which looks like roads and scenes from Radiator Springs, the cars and app work together to present users with obstacles to avoid and races to win. Gone are the days when kids have to only push cars around on the floor; that’s so last year. These cars are a great deal on sale, so shop around! 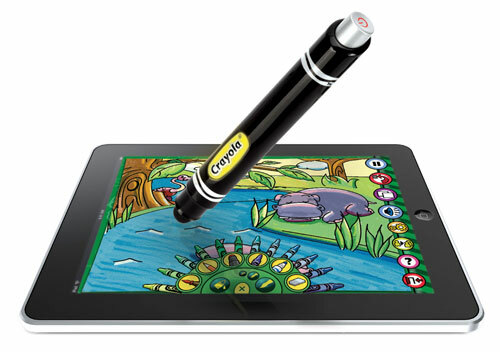 Crayola’s iPad coloring app is brought to life with the iMarker, an electronic stylus in the shape of a classic Crayola marker produced by Griffin Technology. 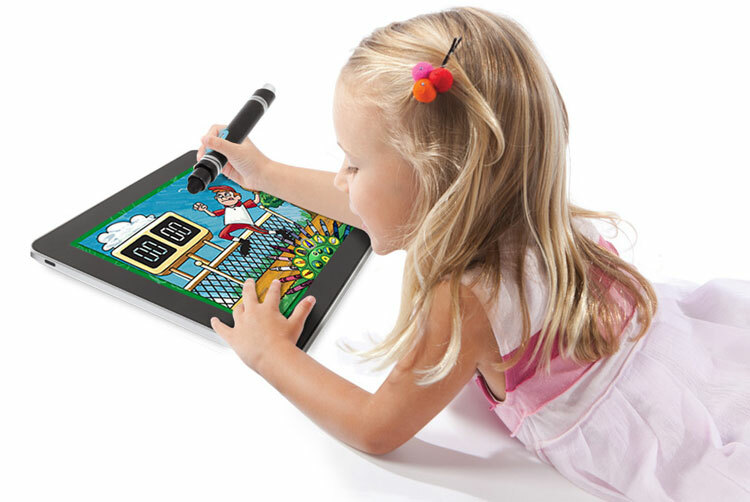 When used with the free Crayola ColorStudio HD app, the iMarker allows kids to draw in the style of a marker, pencil, crayon or paintbrush. Beyond coloring, the iMarker helps users unlock interactive content within the app’s coloring pages, like music and sounds. Just make sure that the iMarker doesn’t get mixed up with your kid’s other coloring supplies. 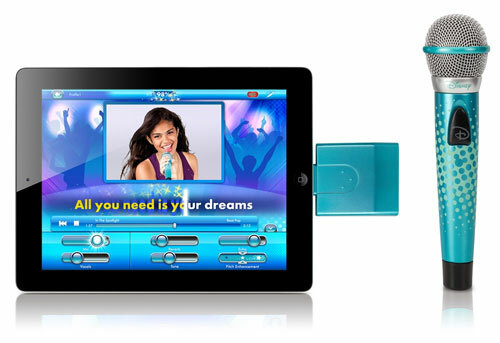 The Disney Spotlight Microphone is a microphone that plugs directly into your iPad; making it an instant karaoke machine. In conjunction with the Spotlight Microphone app, kids can sing along to 10 of their favorite Disney songs while taking advantage of voice editing functions that will make them their own producer. This is a major step up from singing into a hairbrush, but watch for sales as the price varies significantly by retailer. Duo Pop Game Buzzers are a pack of four game show-style buzzers that can be used with three different game apps: Guesstimation, Highlights Hidden Pictures Countdown and Saturday Night Live – The Game. 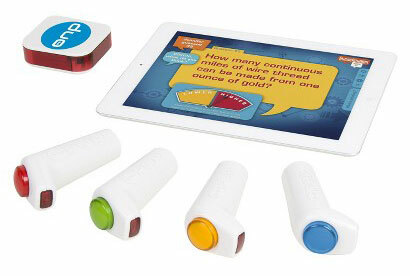 When enabled, up to four players can use the game buzzers to ring in and claim their right to answer a question first in their quest to win the game. A great way to add some technology to family game nights. What do you think of our list of the best iPhone and iPad accessories for kids? Did we miss something? Let us know in the comments below.